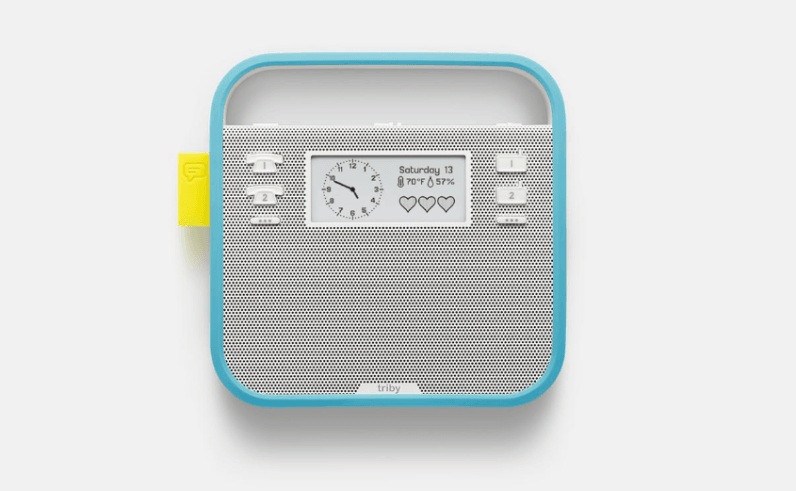 The first product to go live that uses Amazon’s voice assistant Alexa, but isn’t made by the tech giant, has been unveiled as the Triby portable speaker system from startup Invoxia. But to be fair, it’s much more than a speaker. Triby is aiming to be a handy remote control for family life, offering you the ability to make VoiP calls to whoever’s standing nearby via the companion app, as well as use Alexa voice search, music streaming and voice commands for things like Uber. It works over WiFi and pairs with your phone via Bluetooth. “Triby add eggs to my shopping list,” the very progressive stay-at-home dad says in the company’s video. It charges via micro-USB so no pesky wires day-to-day and is magnetic, meaning it’s designed to stick to your fridge, and lets you take hands-free calls when you’re busy. A neat quirk is that you can send doodles from your app to the screen, with a mechanical flag that pops out the side when someone has sent message. It’s currently available in grey, red, green or blue for $199, but note that Alexa only works with Triby in the US right now. It’s not exactly a vital piece of tech for your home, but it is rather cute.